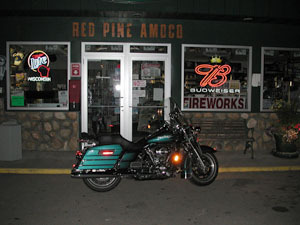 Finally, after another 90 minutes through the woods I made it to the final gas station, the Red Pine Amoco in Silver Cliff, WI. You will not find Silver Cliff in Streets and Trips since the post office counts it as part of Athelstane. Again only an unattended 24 hour credit card. Of course, not all is perfect, I arrived at 1:43AM, but the receipt only shows 1:4 as the time. I assume that since my time was not down to the minute for the 24 hour period, this will not be a problem. Again, the place was deserted, so no chance for a witness at the gas station. 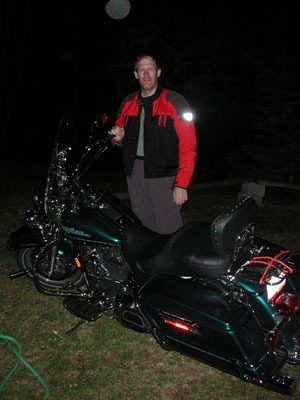 Finally, after 1110 miles, I arrive at our cabin at 2:10 AM, 22:20 since I left Palatine, IL. My wife had arrived from her 6 hour drive from Palatine at around 8 PM and was struggling to wait up for me to sign the witness form and take this picture. So, would I do this again? Maybe, but not for a while. Plan your route to end on large well lit roads, not small forest ones. My first 500 miles almost entirely on freeways took 8:30 hours , the last 500 miles took almost 14 hours. 10 minute gas stops are hard to pull off consistently. What has always been a comfortable seat, may not end up that way. Do not plan any major activities the next day. My wife is expecting jewelry to arrive soon.